The difference between systolic and diastolic readings is at the heart of the debate over which number is more important. VICUS.COM (30 Aug. 2000) -- A clinical advisory statement from the National Institutes of Health, released in May, states that for middle-aged and older patients, systolic blood pressure (the first and higher number in a blood-pressure reading) is more important than diastolic pressure (the second and lower number) for diagnosing and monitoring hypertension. Blood pressure, the force of the blood pushing against the walls of the arteries, is expressed as a fraction. The systolic pressure (top number) is the pressure of blood in the vessels when the heart contracts; diastolic pressure (bottom number) is the pressure of the blood between heartbeats when the heart is at rest. High blood pressure is generally defined as greater than 140/90. When there is no known cause of high blood pressure, it is called primary or essential hypertension, which can be usually be controlled, but not cured. High blood pressure traceable to a specific cause is called secondary hypertension, which can usually be cured if the cause is treated. To understand why systolic blood pressure is important, it is necessary to understand the physiology involved in transporting blood throughout the body. Blood circulates through about 60,000 miles of blood vessels. Each heart beat pushes two to three ounces of oxygenated blood from the heart into the aorta, the body's largest blood vessel. From here, the blood flows to smaller blood vessels and capillaries and eventually transfers its oxygen to cells in the body. The force needed to circulate blood is called blood pressure and is measured in millimeters of mercury (mm Hg). Normal blood pressure is 120/80 mm Hg. Systolic blood pressure (the higher number) is the maximum force exerted against blood vessel walls each time the heart beats, while diastolic blood pressure (the lower number) is the force exerted on the blood vessels when the heart is resting between beats (Zaret, Moser and Cohen, 1992). The emphasis on diastolic blood pressure in hypertension was based on early studies of young people. Now we know that diastolic blood pressure rises until about age 55 and then declines, while systolic blood pressure increases steadily with age. Therefore, it is possible that many older people with "normal" diastolic blood pressure are actually experiencing a worsening of the syndrome of hypertension and its complications, including heart disease and stroke (the first- and third-leading causes of death among Americans), kidney damage, dementia and blindness (Kannel, 2000; Leonetti, et al., 2000; Millar and Lever, 2000). When the systolic blood pressure is high (at or above 140 mm Hg) but diastolic blood pressure is less than 90 mm Hg, the condition is called "isolated systolic hypertension," or ISH. In fact, for older Americans, ISH is a common form of high blood pressure. Among the more than 3,500 people (average age of 58 years; 55% women) participating in the Framingham Heart Study, an ongoing epidemiological study that began in 1948, systolic blood pressure alone identified 96% of hypertensive individuals. This percentage increases to 99% in people older than 60 years of age. 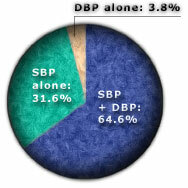 By comparison, diastolic blood pressure correctly classified only 68.4% (Lloyd-Jones, et al., 1999). The comparative ability to diagnose hypertension using systolic or diastolic blood pressure alone or using both readings is illustrated in the accompanying figure. John Russo Jr., PharmD, is senior vice president of medical communications at Vicus.com. He is a pharmacist and medical writer with more than 20 years of experience in medical education. Kannel WB. Elevated systolic blood pressure as a cardiovascular risk factor. Am J Cardiol. 2000 Jan 15; 85(2):251-5. Kannel WB. The Framingham Study: Its 50-year legacy and future promise. J Atheroscler Thromb. 2000; 6(2):60-6. Leonetti G, Cuspidi C, et al. Is systolic pressure a better target for antihypertensive treatment than diastolic pressure? J Hypertens Suppl. 2000 Jul; 18(3):S13-20. Lloyd-Jones DM, Evans JC, et al. Differential impact of systolic and diastolic blood pressure level on JNC-VI staging. Joint National Committee on Prevention, Detection, Evaluation, and Treatment of High Blood Pressure. Hypertension. 1999 Sep; 34(3):381-5. Millar JA, Lever AF. Excess mortality associated with increased pulse pressure among middle-aged men and women is explained by high systolic blood pressure. J Hypertens. 2000 Aug; 18(8):1155. National Heart Lung and Blood Institute. NHLBI Issues New Clinical Advisory On Systolic Blood Pressure. 4 May 2000. Zaret BL, Moser M, Cohen LS [eds]. High Blood Pressure. Chapter 12. Yale University School of Medicine Heart Book. New York (NY): Hearst Books; 1992.